A Cormier Home is not just an investment in a home, but a way of living. Our homes are designed specifically with the buyer in mind to ensure quality, comfort, livability, while making sure we pay attention to detail. Just take a look below and you’ll see that what we call standard features in our homes, other builders are calling upgrades. With this much style, comfort, and value, you can never go wrong with a Cormier Home! Low-E Windows Will Save You Money All Year! Low-emittance (low-E) coatings are microscopically thin, virtually invisible, metal or metallic oxide layers deposited on a window or skylight glazing surface primarily to reduce the U-factor by suppressing radiative heat flow. The principal mechanism of heat transfer in multilayer glazing is thermal radiation from a warm pane of glass to a cooler pane. Coating a glass surface with a low-emittance material and facing that coating into the gap between the glass layers blocks a significant amount of this radiant heat transfer, thus lowering the total heat flow through the window. Low-E coatings are transparent to visible light. Different types of low-E coatings have been designed to allow for high solar gain, moderate solar gain, or low solar gain. In heating-dominated climates with a modest amount of cooling or climates where both heating and cooling are required, low-E coatings with high-, moderate- or low-solar-gains may result in similar annual energy costs depending on the house design and operation. While higher solar-gain glazings perform better in winter, lower solar-gain glazings perform better in summer. In cooling-dominated climates, the priority is to lower solar gains. Radiant Barriers Really Work! LP® TechShield® is a cost-effective, energy-efficient solution for earning green building credits and helping meet codes. The product installs like conventional roof sheathing, requiring no additional labor. LP TechShield offers a variety of homeowner benefits: potentially reduces tonnage of the HVAC system, cuts monthly air conditioning bills up to 17%, and may qualify for utility rebates. LP® TechShield® helps reduce energy consumption. It reduces the heat load on in-attic air handling systems, cutting monthly air conditioning bills up to 17%. 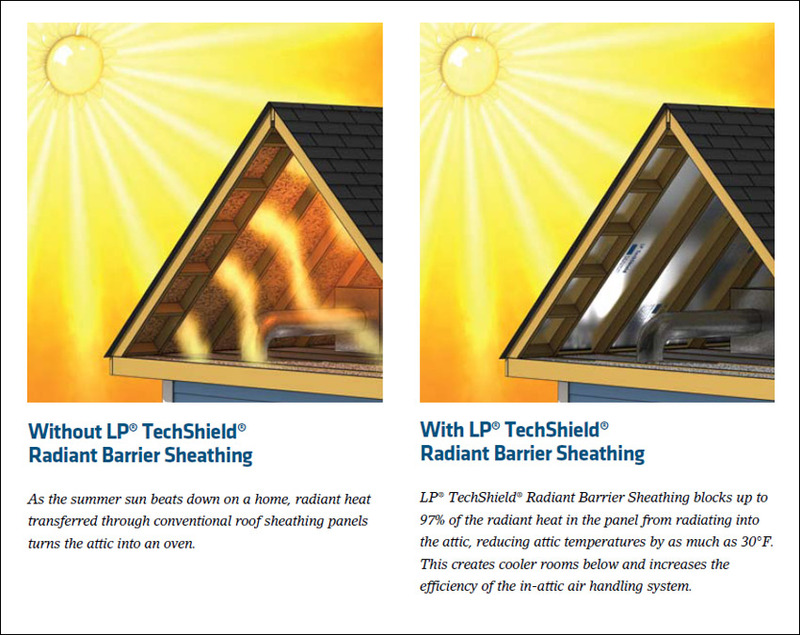 Several other factors make LP TechShield Radiant Barrier an environmentally friendly building material. Our manufacturing process uses wood certified under Sustainable Forestry Initiative® standards. That wood comes from small, fast growing trees, and the entire log is used. This means less waste and more efficient use of resources. Plus, LP TechShield Radiant Barrier contains no urea-formaldehyde, and we use only low-emitting, safe resins as a binder. Tight Construction and Ducts: Sealing holes and cracks in the home’s “envelope” and in heating and cooling duct systems helps reduce drafts, moisture, dust, pollen, and noise. A tightly sealed home improves comfort and indoor air quality while reducing utility and maintenance. In typical homes, air leaks are often found at cracks, small holes, and penetrations for plumbing, wiring, lighting, and ductwork. Together, these leaks can add up to as much air loss as having an open window! It’s easy to imagine how this can increase a homeowner’s utility bills and reduce comfort. 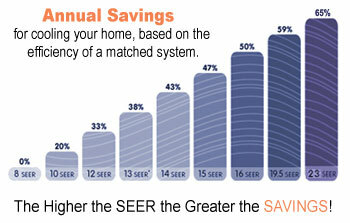 Cormier Homes installs 13-SEER Air Conditioners in all of their homes as standard equipment. If you are interested in even higher-efficiency air-conditioners, systems can be designed to your specifications. SEER is based on tests performed in accordance with AHRI 210/240 (formerly ARI Standard 210/240)1 In April 2004, the Federal Department of Energy (DOE) finalized regulations requiring that, beginning January 2006, air conditioners manufactured and installed within the United States must meet an efficiency level of at least 13 SEER. This represents a 30% increase in efficiency over the existing minimum standard of 10 SEER, which has been in place since 1992. 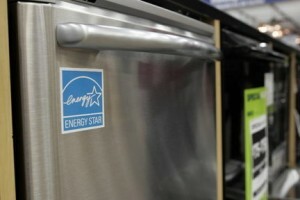 Some of the Energy Star qualified products that Cormier Homes often uses include lighting fixtures, compact fluorescent bulbs, ventilation fans, and appliances, such as refrigerators, dishwashers, and washing machines. The Safeway Built-In Pest Control System is installed in interior and exterior studs, much like electrical wiring and is usually installed after the electrical inspection and before insulation placement. We use polyethylene tubing with evenly spaced perforations to deliver a fine mist of quick-drying chemical. The tubing is manufactured without connectors, eliminating the chance of separation. The perforated portion of the tubing is sewn through the studs, while the un-perforated portion is routed to a small service port in the exterior of the building. 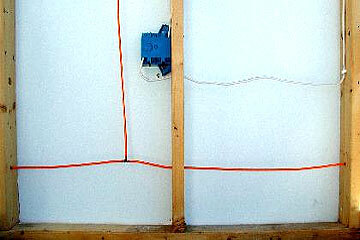 In addition to the exterior walls, all “wet walls” also receive the tubing application. Tubing is run through the walls of your house to a service port on the outside of your home. It can then be easily serviced by a licensed technician whether the homeowner is there or not! No advance preparations are needed on the inside of the home, and the homeowner does not have to keep an appointment to be treated. Also, chemicals are only delivered to the inside of the walls, so there is no need to keep children or pets away from the chemical until it dries, and no need to worry about any effects the chemicals may have on carpets or walls. Chemical is delivered right into the walls where many pests live and breed. Since the development of our system, it has proven to be effective, safe and reliable. We have over 10 years of service to the homes with the built-in systems. Because all treatments are performed from the outside of the house, no one enters the home and there is no need to leave a key, a code, or an open door. The Safeway Built-in Pest Control System costs just pennies a square foot, making the system an affordable alternative to traditional pest control service. A new home is a major purchase with potential to increase in value. Will it be a good investment? Was it built by an experienced professional builder? Were quality materials used? You can see the finished product, but what about those components that you can’t see which make up the structure of your new home? Unlike implied promises or handshake deals, the HOME Limited Warranty assures you that your new home is protected for ten years. By including the HOME of Texas Limited Warranty with your new home, your builder is backing his or her reputation with a written, insured warranty. If you have a warranted problem within the applicable coverage period, it will be corrected by the builder, or HOME will fulfill your builder’s obligations under the warranty. The HOME Limited Warranty is an excellent sales tool. If you decide to sell your home during the term of the warranty, the remaining warranty protection automatically transfers to future owners. Every builder who offers a HOME Limited Warranty must first meet stringent criteria. Builders are re-screened annually to ensure their performance remains consistent with membership standards. Builders are evaluated on financial stability, customer satisfaction and technical competence. HOME Builders must also comply with specific construction standards in order to have their homes warranted by HOME. If your builder provides the HOME Limited Warranty, you can be certain that your home was built by a qualified professional. What if your builder is unable to meet the warranty obligations? Builders in the HOME program have an excellent record of fulfilling the terms of the warranty; but, unforeseen circumstances can prevent a builder from keeping his or her commitments. The HOME Limited Warranty is fully insured, and warranted items will be covered by HOME’s insurers if your builder cannot comply. The HOME Limited Warranty provides ten years of protection for your new home. Be sure to read your warranty book for specific warranty standards, definitions and limits to coverage. Warranted callback items in the first year of the warranty period will be corrected by your builder, with backing by HOME’s insurers. If certain portions of the home’s cooling, heating, ventilating, electrical or plumbing systems do not meet the warranty standards in the first two years of the warranty period, your builder will correct the problem. In the unlikely event that your new home develops a warranted structural defect as described in your warranty book, the defect is covered by your builder in Years 1 and 2 and by HOME’s insurers in Years 3-10. With any new home, ongoing maintenance is necessary and is the homeowner’s responsibility. Your builder can assist you in understanding how you can take care of your home to avoid problems. The HOME Limited Warranty defines the gray areas. Standards to determine potential defects, the builder’s obligations, and warranty issue resolution procedures are outlined in your warranty book. HOME’s proven methods help resolve disputes between builders and homeowners. Even with a written warranty, builders and home owners may not always see eye to eye. Fortunately for both parties, the HOME Limited Warranty includes an arbitration process to resolve disputes quickly and inexpensively.